CANTON, MA (June 20, 2017) – June 21 marks the first day of summer 2017, and a new survey commissioned by Dunkin’ Donuts, a summer beverage destination, shows that two-thirds (67%) of adults are looking forward to summer more this year than in previous years. In fact, nearly 40% say they would actually take a pay cut in exchange for more time off this summer. Rising temperatures can also equal rising FOMO, as nearly 40% also claim their “Fear of Missing Out” increases during the summer. Will coffee fuel folks’ fun this summer? Nearly two-thirds (65%) agree that a great cup of coffee makes their summer activities more enjoyable. Sometimes summer fun is replaced by summer guilt, as more than one-third (34%) of adults admit always or sometimes feeling sorry about taking time off from their jobs during the summer. Can you have summer fun without photos? One in six adults (17%) claim they would actually cut their vacation short if they couldn’t take or post photos from it. For more survey results, visit the Dunkin’ Donuts blog at https://news.dunkindonuts.com/blog/Firstdayofsummer. To celebrate the first day of summer, Dunkin’ Donuts has brewed a fun way to give fans a chance to win $10,000 to help make the most of their summer. Dunkin’ Donuts has created a special summer-themed Snapchat Geofilter available on Wednesday, June 21 only, exclusively at all U.S. Dunkin’ Donuts restaurants. Anyone who welcomes the start of summer 2017 by visiting a Dunkin’ Donuts restaurant and sending a Snap with the Geofilter to Dunkin’ Donuts (dunkindonuts) is entered for a chance to win a grand prize of $10,000. In addition, six lucky fans will win a summer’s worth of free Dunkin’ coffee. No purchase or payment or data usage necessary, legal U.S. residents, 18+. Void where prohibited. For additional terms and conditions, please visit www.dunkinpromotions.com. On the longest day of the year, Dunkin’ Donuts is also creating the brand’s longest Instagram story ever. Fans are invited to check out the brand’s official Instagram page and follow along all-day long to see live adventures of a Dunkin’ Donuts coffee drinker celebrating the spirit of #SummerNotSorry and making the most of the season. The first day of summer is guaranteed to be filled with fun, visually-stimulating activities, all fueled by the flavors of Dunkin’ Donuts’ iced and frozen coffees. 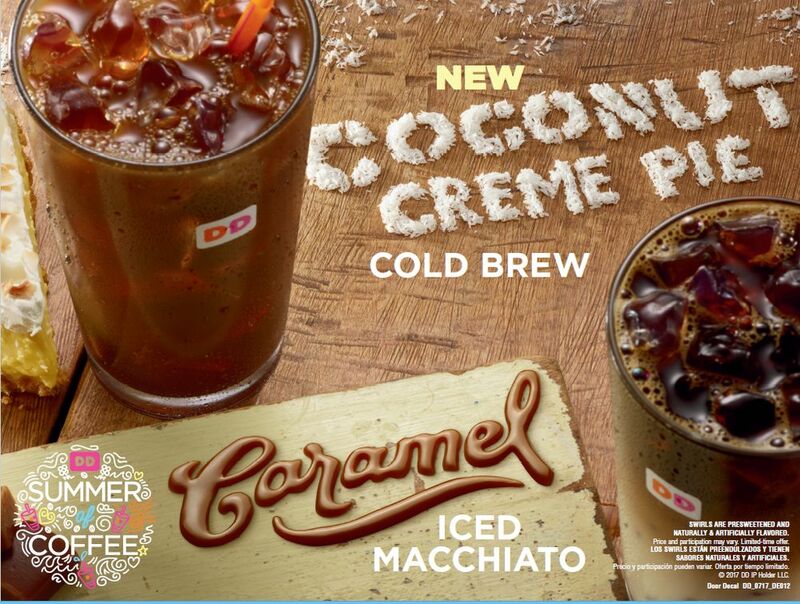 Dunkin’ Donuts has a full lineup of iced and frozen coffee choices perfect for keeping energized throughout each and every summer day, including new Frozen Dunkin’ Coffee, iced coffee and espresso beverages, Cold Brew coffee, and ready-to-drink bottled iced coffees. 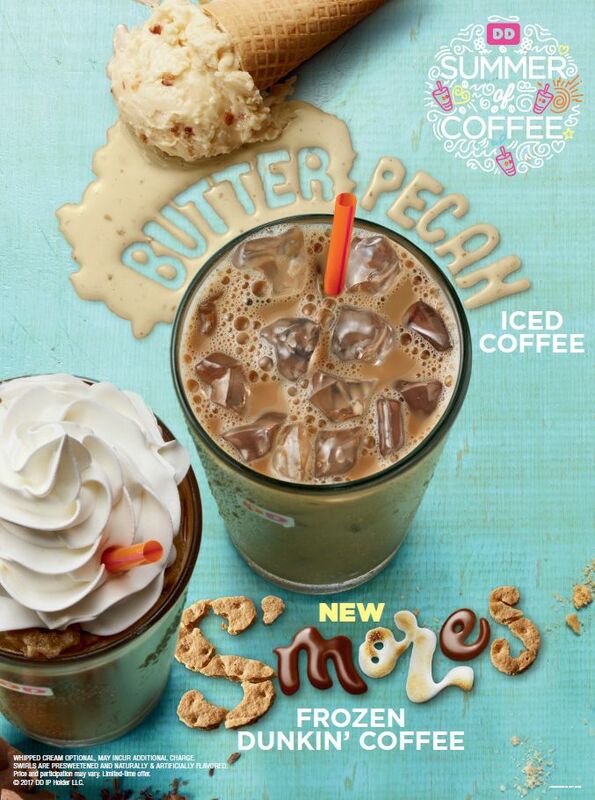 For summer, Dunkin’ Donuts restaurants are serving delicious coffee flavors that perfectly capture the spirit of the season, including S’mores, Coconut Crème Pie and Butter Pecan. 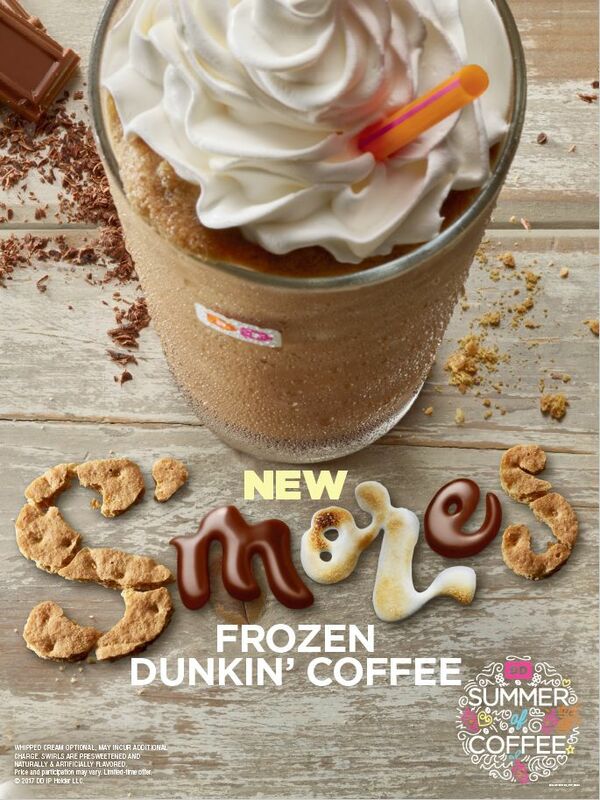 Dunkin’ Donuts also has a special summer offer for its newest frozen beverage, serving a small Frozen Dunkin’ Coffee for the special price of $1.99 through July 2. Crafted to deliver the authentic taste of Dunkin’ Donuts’ Original Blend coffee, Frozen Dunkin’ Coffee is made with a special extract featuring 100% Arabica coffee to bring forward the signature flavor of the brand’s premium coffee, blended with ice and dairy for a rich, sweet and creamy beverage to keep guests energized any time of day. This survey was conducted online June 9 through June 10, 2017 among a representative sample of 999 US adults 18 years old or older by Toluna, an independent research provider, under the guidance of RF|Binder’s research team. The results are nationally representative according to the US Census Bureau statistics to accurately reflect the gender, age, income, ethnicity and region of the US general population.